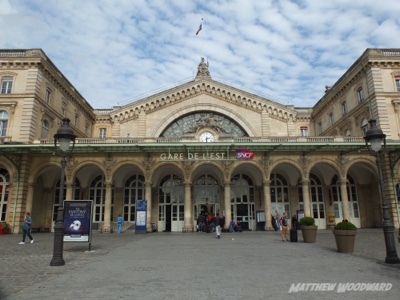 Paris Gare d’Est is a charming and rather old school French railway station. By modern standards it’s simple, but perfectly formed. The atmosphere is relaxed, but there are signs of obvious tension around the edges. Paris has suffered so much and security is obviously at a heightened state, especially at railway stations. My immediate priority on arrival is an emergency ablution pit stop. I’m not well. As I have a first class ticket for my next train, I head straight for the SNCF Grand Voyage lounge. Outside the lounge are a pair of female soldiers dressed in full combats. They are armed not with assault rifles, but with heavy machine guns so large it makes them look like small soldiers. It’s a sign of the times. Like a puzzle from the “Crystal Maze” television show, the door to the lounge does not open. At first I think it’s a door controlled by a sensor, so I move about, gently at first, and eventually even throwing some shapes. The door stays firmly closed. I look around feeling foolish, but there is no obvious sign of how to get in. The soldiers stare but offer no guidance. In the end I have to wait for a regular who shows me the secret button, hidden on a pole behind a bush. Very cunning. The “duplex” or “double-decker” trains are huge, and the silver locomotives look very impressive. Just in case you might not be aware, the “Double Deckers” was a slightly cult and influential British children’s television show in the 1970’s. There is a catchy theme tune too, but I shall spare you from that here. My service today is the latest (third generation) version of this TGV type, known as the EuroDuplex. It’s a cool train, and I don’t care if you think I’m a trainspotter for saying so. 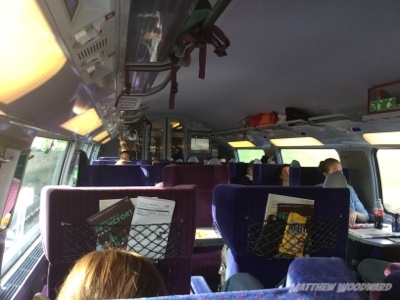 I head for carriage 11, seat 93 – it’s a top deck seat in first class. I had booked a seat facing the direction of travel, and seat 93 isn’t. The reason for this as I later discover is that the train changes direction in Stuttgart. Right on time at 15.55 we cruise out of Paris, and once out of the suburbs we quickly break the 300 km/h barrier. It feels effortless and the ride is incredibly smooth. This is a journey to savour as the seats are very comfy and I’m pretty tired. I fall asleep almost immediately and wake up in Strasbourg, 1 hour and 40 minutes later. The staff on the train are great. They all speak German, French and some English. In the end I give up with my French, as I don’t want to accidentally address a German in French, so I just stick to English. It seems best all round. A friendly chap with a cap at a jaunty angle and a pierced ear takes regular orders for food and drink. I’m just not feeling well enough to eat, but I manage to drink lots of water. After a relaxing afternoon passing through some great scenery, the train glides into Munich at 21.30, the end of the line for this service. Munich is not a particularly modern or beautiful station, but it has a huge number of platforms. This leg has been easy, comfortable and shows off all that is good about European high-speed rail. My plan here is to hold my own mini Oktoberfest in the two hours I have before my next train. One of the helpful DB staff confirms that I need to be on platform 14 at 23.35 for Budapest. As I head for a beer keller I have to do a bit of a double take in the station concourse. Nearly everyone is dressed in lederhosen or traditional costume. The men look slightly comical and the women look just lovely. Oktoberfest is a big deal locally as well as internationally, and I feel quite underdressed. I hope to return to Munich later this trip, as the prices for rooms are incredibly high in September. Tonight I’m going to keep heading east. I almost feel guilty that I have been thoroughly entertained by your travels so far, especially when you discovered you were on the wrong train! That must have been a moment. Such are the joys of travelling and indeed half the reason why we do it in the first place. I hope you are feeling better very soon and I look forward to reading the next instalment of your adventure.